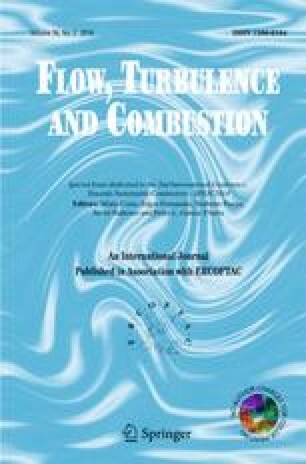 This paper presents a numerical modeling study of one ethanol spray flame from the Delft Spray-in-Hot-Coflow (DSHC) database, which has been used to study Moderate or Intense Low-oxygen Dilution (MILD) combustion of liquid fuels (Correia Rodrigues et al. Combust. Flame 162(3), 759–773, 2015). A “Lagrangian-Lagrangian” approach is adopted where both the joint velocity-scalar Probability Density Function (PDF) for the continuous phase and the joint PDF of droplet properties are modeled and solved. The evolution of the gas phase composition is described by a Flamelet Generated Manifold (FGM) and the interaction by exchange with the mean (IEM) micro-mixing model. Effects of finite conductivity on droplet heating and evaporation are accounted for. The inlet boundary conditions starting in the dilute spray region are obtained from the available experimental data together with the results of a calculation of the spray including the dense region using ANSYS Fluent 15. A method is developed to determine a good estimation for the initial droplet temperature. The inclusion of the “1/3” rule for droplet evaporation and dispersion models is shown to be very important. The current modeling approach is capable of accurately predicting main properties, including mean velocity, droplet mean diameter and number density. The gas temperature is under-predicted in the region where the enthalpy loss due to droplet evaporation is important. The flame structure analysis reveals the existence of two heat release regions, respectively having the characteristics of a premixed and a diffusion flame. The experimental and modeled temperature PDFs are compared, highlighting the capabilities and limitations of the proposed model. This article is distributed under the terms of the Creative Commons Attribution 4.0 Inter795 national License (http://creativecommons.org/licenses/by/4.0/), which permits unrestricted use, distribution, and reproduction in any medium, provided you give appropriate credit to the original author(s) and the source, provide a link to the Creative Commons license, and indicate if changes were made.